I ventured up to the J.Crew Factory store a few weeks ago for the first time since the holidays in hopes of finding some spring items (despite all of the snow on the ground). I sadly didn’t see a lot that caught my eye. The standout patterns were two recycles from last year – the photo floral print as well as the moonglow paisley, both of which I have from retail last year. I didn’t feel the need to add any items, although the Factory photo floral dress is growing on me. 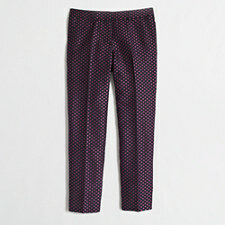 The one item I did see in store and liked on the rack were the Factory Jacquard Pants in navy/fresh berry. Why the primary color is billed as navy, I’m not sure, because these pants are most definitely black with a berry/blue stitched print on them (still no navy). My store only had a size run up to a 12, and I usually take a 14 in the skimmer pants. I tried the 12s on for the heck of it, but couldn’t even get my legs in to them. Eek. I went home and ordered the size 14 and 16, which was a good call because the 14s were also tight, but of course, the 16s just a bit loose in the waist, but nothing a belt couldn’t fix. 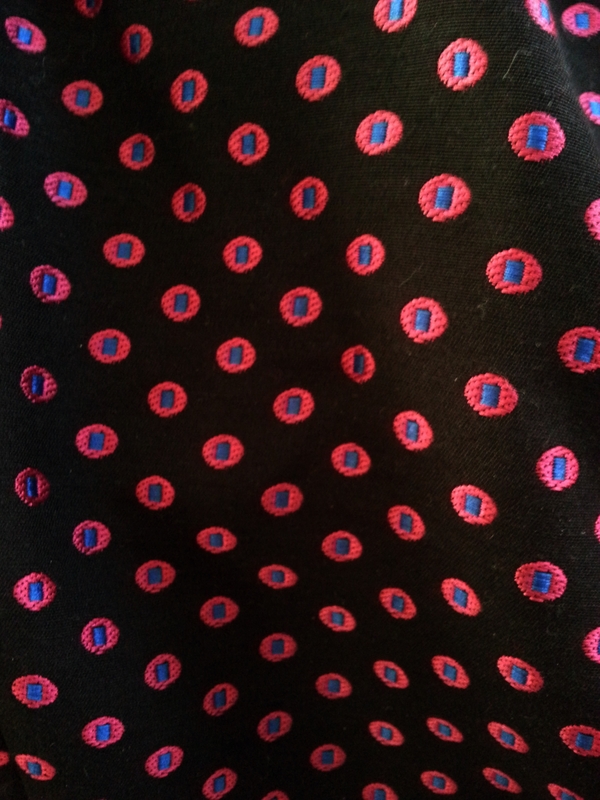 Here’s a closeup of the fabric. 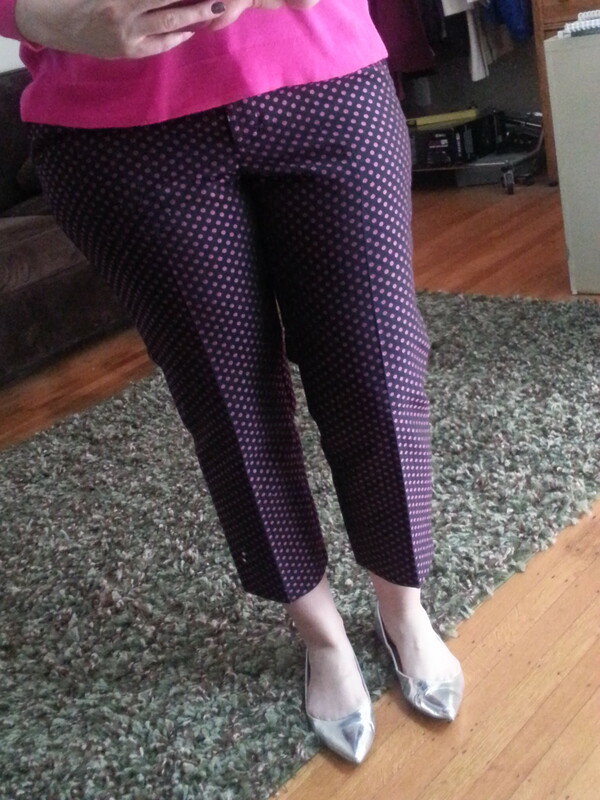 These pants are polyester/cotton mix and not lined but have a sateen look to them. 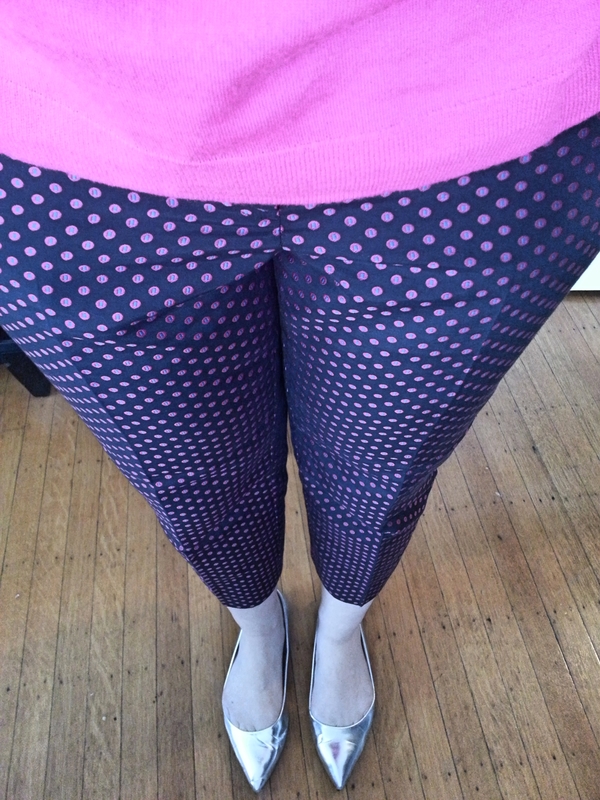 They have a 26″ inseam which for my 5’8″ frame is a little shorter than I like; so they’re definitely more of a capri than an ankle pant on me. There’s a few inches of fabric in the hem, so if I keep them, I’ll likely have the hem taken down so they’re more of an ankle pant. I didn’t get a picture of the waist, but I probably have at least an inch of room in the waist that’s gaping in the back. But I need the room in the hips/rear. If I have the hem taken down, I could have the waist taken in as well. If you’re a little straighter, you may just want to size up one size. I ended up sizing up 2 and it’s not a perfect fit. As you can see, they hit a few inches above my ankle. 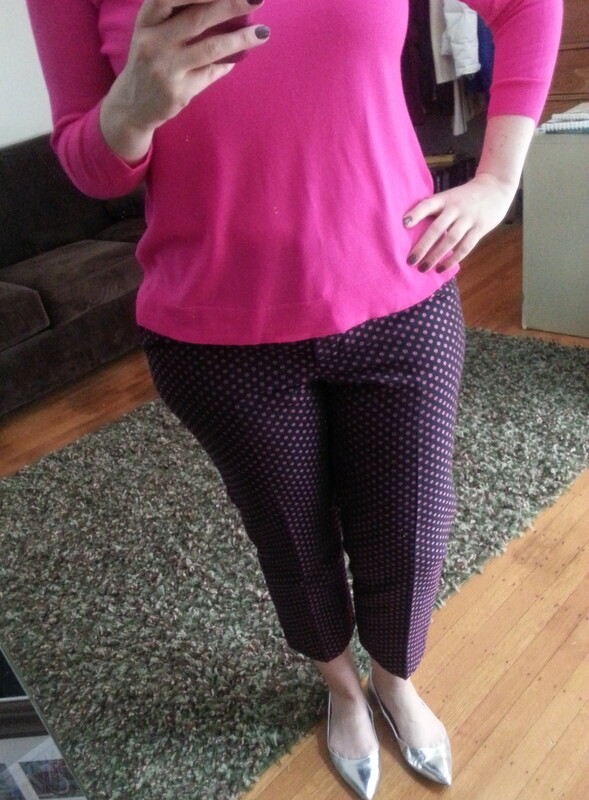 These pants are right in my color palette – anything I can pair with bright pink I’m in to. I think they’d also look great with a crisp white button down or a chambray shirt. I’m wearing the J.Crew merino boyfriend sweater from 2014 in this photo (similar Factory sweater here) as well as the J.Crew metallic Viv flats (similar pointy-toe here and round toe flats here). Aside from a few dresses which I’ll review in another post, I’m not seeing a ton to love at Factory this spring. How about you, do you have these pants? Anything you’re loving at Factory this spring? Would love to hear what you think and thanks for visiting. Thanks for the review. I think they look fab on you. I got mine, and love them. Waiting for warmer weather to wear them.